One-Pot pasta with tomato sauce and mascarpone 5 out of 5 based on 1 ratings. 1 user reviews. This recipe is a perfect family week night dinner recipe, quick and easy to prepare and you just need one big pot to make it. And it’s a delicious vegetarian dish! 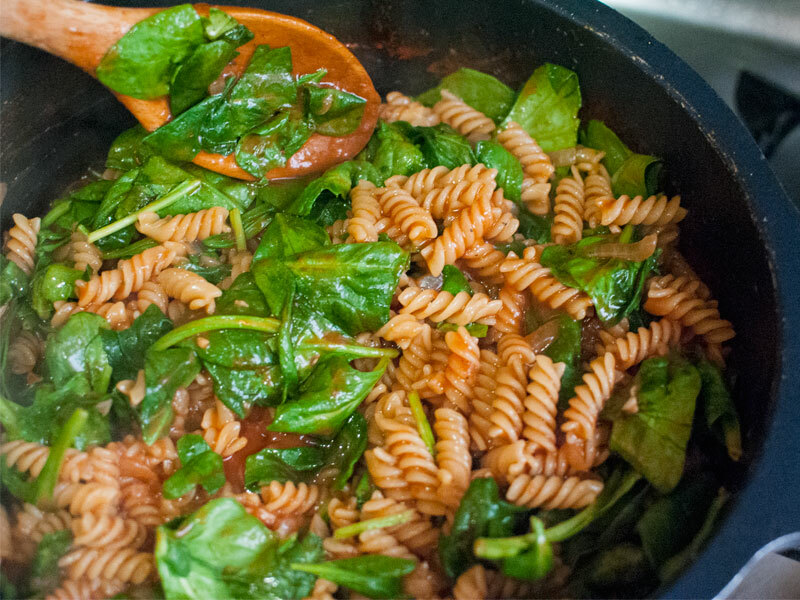 First you prepare the tomato sauce, then you add the pasta and the cooking water in the same pot, let it cook and add the spinach and mascarpone at the very end. 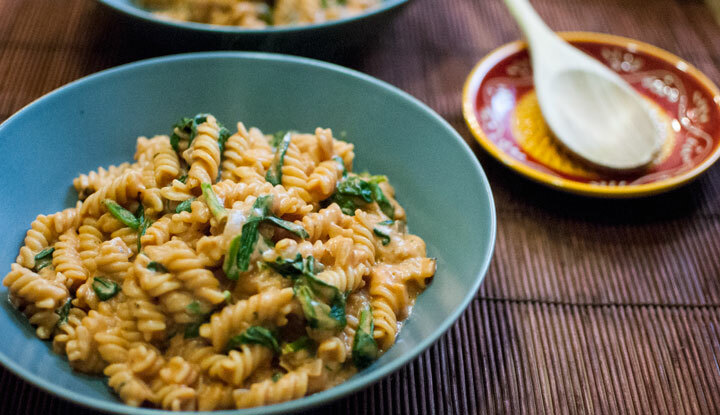 The One-Pot pasta with tomato sauce and mascarpone is ready to eat! 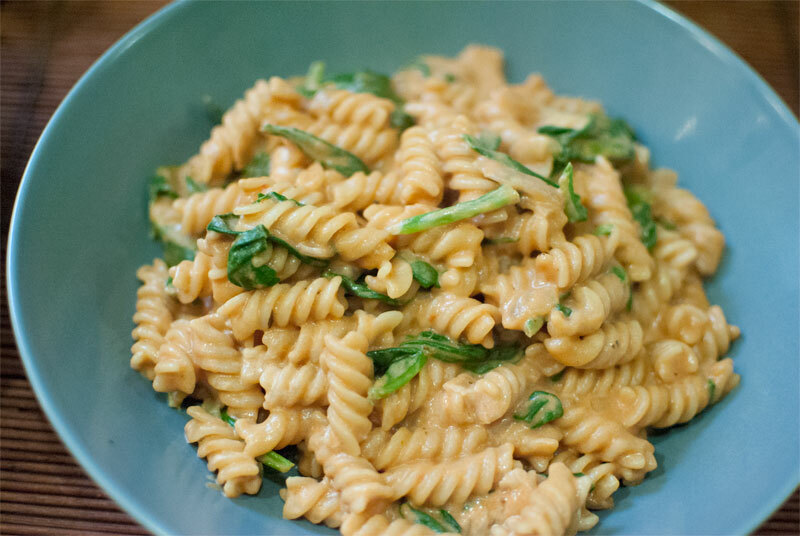 This One-Pot pasta recipe was my first attempt at a One-Pot meal recipe, inspired by Ciao Veggie blog, and I have been very surprised by the result: the pasta is so creamy and tasty thanks to the mascarpone, and the spinach adds a nice crunchy texture to the sauce. You can basically prepare this One-Pot pasta with any kind of tomato sauce that you like (with basil, peppers, carrots, curry etc.) and adapt it according to what you have in the fridge. 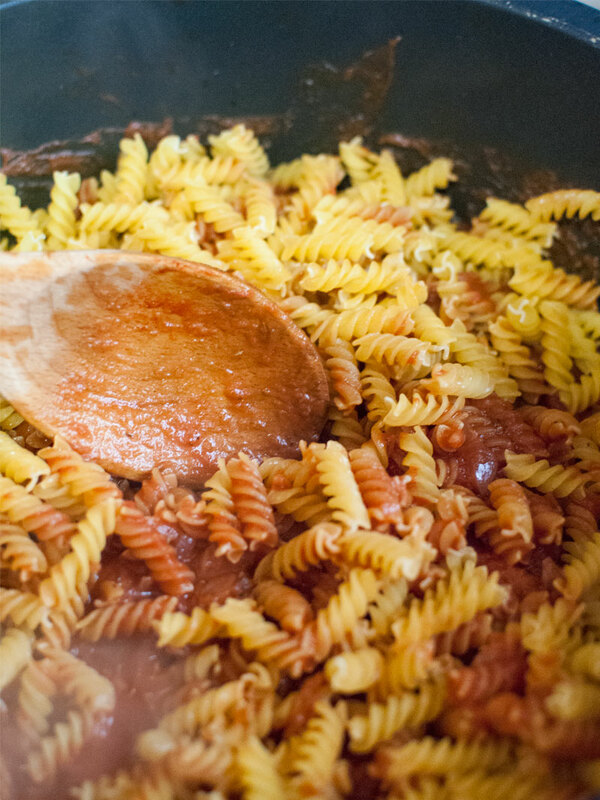 The proportion of water might vary regarding the type of pasta, so it is better to keep an eye on it during the cooking, stir occasionally and add a bit more water if needed. 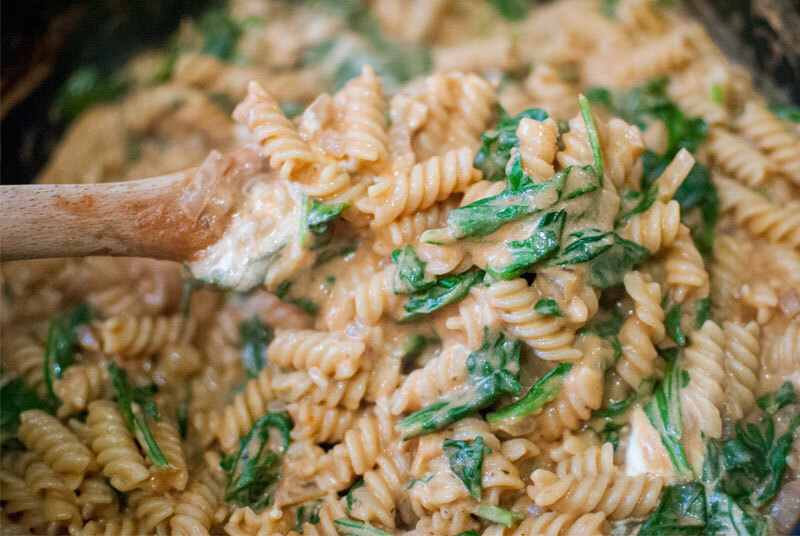 It it better if the pasta is slightly “al dente” Italian style before adding the spinach, it will get tender by the end of the last steps of the preparation. On the other hand, it is ok if the sauce is a little bit liquid at the end of the cooking time, it will turn into a delicious sauce once you add the mascarpone. Even if the volume of the raw spinach seems to be huge, don’t forget that the leaves will shrink once they are cooked, so you won’t have so much remaining after cooking. Pour a little bit of olive oil in a big pot and heat at medium temperature. Chop the onion and place the pieces in the pot once the olive oil is hot. 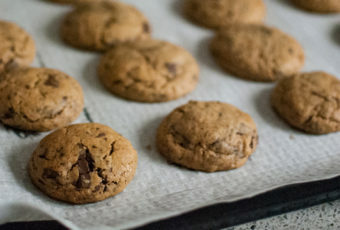 Cook slowly until soft. In the meantime, chop the garlic cloves and incorporate them to the pot once the onion are ready, and cook for 2 more minutes. 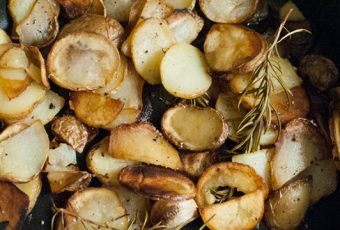 Season with salt, pepper, grounded coriander seeds and provencal herbs, pour the wine and let it evaporate for a couple of minutes. Pour the diced tomatoes into the pot once the wine is evaporated. 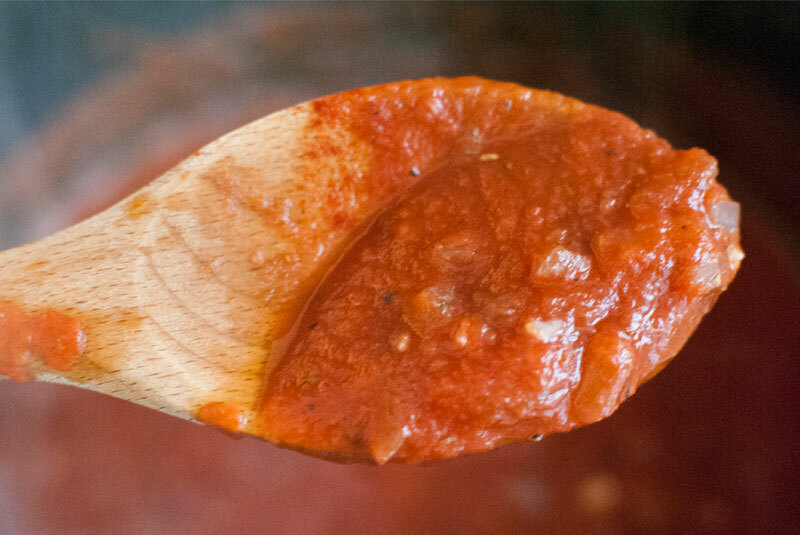 Add the hot paprika and let the tomato sauce cook for 10 minutes, mixing occasionally. In the meantime heat the water. 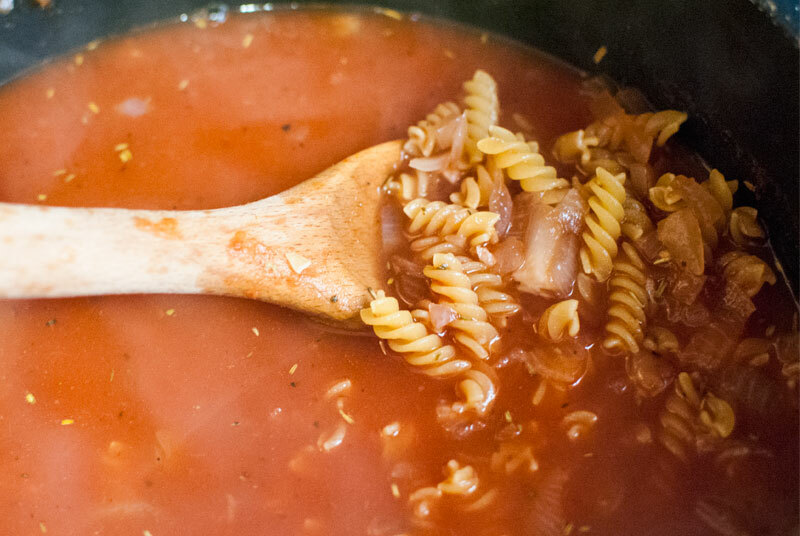 Once the tomato sauce is ready, incorporate the fusili pasta, the hot water and the cube broth in the pot, mix well all the ingredients and let it cook during 10 to 12 minutes. Keep an eye on the pot and stir regularly, adding a little bit of hot water if necessary. 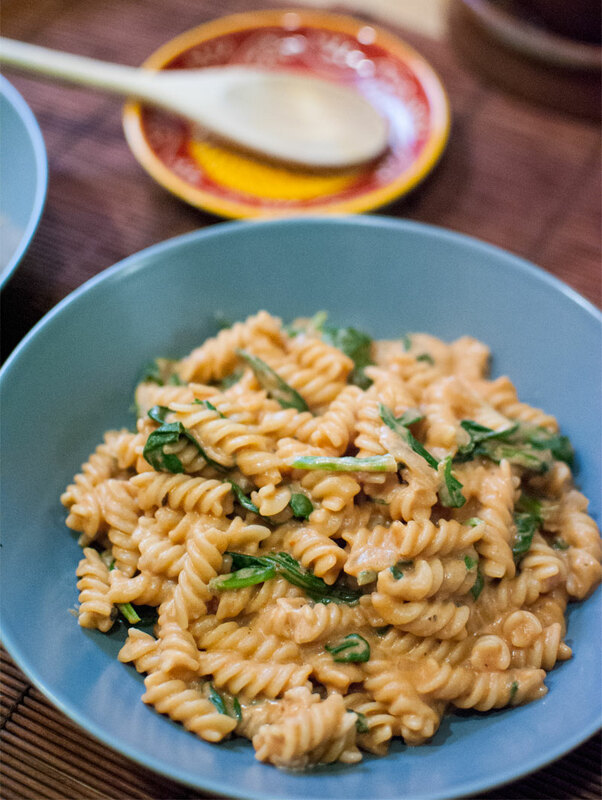 Once the pasta is cooked "al dente", means still a little bit hard, add the spinach and mix until they shrink and are incorporated to the pasta. Finally add the mascarpone in the pot, mix well with the pasta and serve very hot with the basil spread over.